Today ladies I follow in your footsteps, without you going before me I would not have the career that I now enjoy so much. For the past 19 years, I have been a Long Haul Flight Attendant with Qantas, joining the company in August 1988. This of course was the bicentennial year and Australia's tourism was booming. In fact when I joined there was a training class a week, the ratio of women to men was 15 to 1 and hence our nickname became Bicentennial Babes. For the past three and a half years I have stepped back in time to the era of the Boeing 707, and not just any 707, but Qantas' very first, the 29th off the Renton production line. VH-EBA, the City of Canberra was first delivered on 7th June, 1959, way before I was even born! VH-EBA was brought back home on the 16th December last year. So I know you are trying to figure out if you worked on her or not, so if you flew between June 1959 and November 1967 there is every chance you would have. This aircraft was purchased last July by the Qantas Foundation Memorial and is registered as VH-XBA and will return to its original rego of EBA when it takes its home at the Museum in Longreach, Queensland. This aircraft holds so much historical importance to Australia and Qantas. It was Australia's first jet aeroplane on the civil register, the first 707 sold outside of the USA and Qantas' first jet transport. She is both the oldest flying 707 and the oldest surviving 707. She was originally named City of Canberra but this was just for a short period before it was changed to City of Melbourne. EBA remained in the US for fifth pod certification and came to Australia after EBB, so EBB was christened City of Canberra for political correctness. There were only 13 of this model 707-138 ever made, they being specifically built to order for Qantas under the direction of Ron Yates. So QFM owns the first of the series, and the last, EBM, being owned by John Travolta, or JT for those of us who like to think we're in the know. The aircraft has had a number of previous owners, including M. Jackson and that is Michael not Margaret, its last owner was a member of the Saudi royal family. This aircraft was discovered in England, at Southend-on-Sea which is just over an hours train ride east of London on the Thames Estuary. A place where aircraft go to change owners, registration, colour schemes and even to die. In 2002, A Qantas Engineer, a keen plane spotter, noticed that the serial number matched that of Qantas' first 138 aircraft. It was decided to rescue her from the wreckers. For the past 3½ years a wonderful band of volunteers has put in over 15 000 man hours to save and return this aircraft to Australia. Negotiations for its purchase went to the very highest levels of the UK and Australian Governments and were by far and away the most difficult part of the project. I became involved in this project as the curator, to collect any memorabilia that people might have, and wish to donate to the QFM at Longreach. My role as the Flight Attendant or Flight Hostess came much later as the project neared its final stages. An initial team of engineers travelled to Southend-on-Sea in the UK in January 2006 to see what state the aircraft was in and if it could be recovered and by what means. As you can imagine, there was a lot of concern especially about corrosion with it being parked for so long and in such inclement weather by the sea. They thought they would have to break her up into small pieces and ship her home. Word came back after a good look over the aircraft that there were no "SHOW STOPPERS", so instead of dismantling and shipping her back it looked like with some work that she could be flown home. The most fitting way I say too. So in June 2006 a team of 10 engineers flew to Southend and commenced restoration. On my trips to London I would go to Southend and visit and really wondered if this thing would ever get off the ground again, but the dedication and passion of these men who would not accept less than 100% was inspiring and I knew that it was only a matter of time before the call would come to go to England to fly her home. The experience of these people and their passion is not something that can be traded. As work continued and meetings in Australia with the flight crew started, it was decided that they would need a Flight Hostess and since they already had one on the committee, they asked me if I would like to join the team for the trip home. No need to explain what the answer was to that one. With not much notice and a uniform borrowed from Lynley and the Promotional Team Heritage Collection, the race was on to get a jungle green uniform made to fit me. Of course I did wish I could fit into the promotional team one, but no amount of dieting would have made that possible. The material was impossible to find, though we were able to match the colour perfectly, Unfortunately, the only problem was it being 100% cotton and we all know how cotton doesn't travel the best. I was very fortunate to find two dressmakers in Chatswood who were up to the task of making it in short time for me. When I said I needed it in 10 days and only one fitting on the day of pick up they just laughed at me and said that it was impossible, but I told them the story of the aircraft and the importance of the uniform and they stepped up to the challenge. I was really pleased with the result and felt it connected nicely the Flight Hostess with the aircraft. 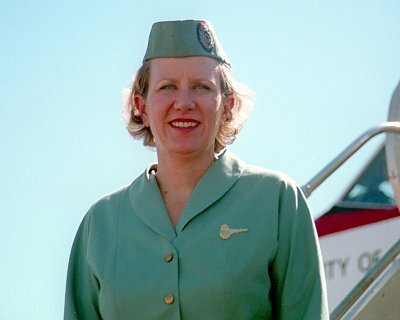 I did have some help keeping it authentic, Xiena Healey gave me the buttons for the uniform and Joan Gilbert the wings. David Jones supplied the "step ins". The tech crew for this journey were all ex RAAF 33 Squadron, in fact two still are with the Squadron in the reserves, and were all instructors on the B707 prior to joining Qantas. The RAAF helping out with their simulators for refresher training. For our Commander, Murray Warfield, it had been close to 20 years since he had flown a 707. So, in late November, the adventure began, 3 Captains, 2 Flight Engineers and I went to the UK to bring her home. Joining us for the flight home we also had the company of 3 Engineers our own CASA rep and 2 documentary makers. So, like you before me, I found myself surrounded by males. The sole female and only Flight Hostess for the journey. What should have been a few days before we left to return to Sydney turned into 3 weeks as a problem was encountered with the starting of the No 2 engine. As you can imagine, spare parts were getting a little hard to find, but the spirit of co-operation from all parts of the globe helped us see it through. No problem was too hard for the engineers and by a process of elimination and some serious work it was fixed and better than new. In fact the pilots thought she was a little pocket rocket. During this time they assigned all sorts of jobs to me, all hands were needed on deck, so now I can work the oxygen system, put on the hush kits, find my way through the Lower 41, open the rear cargo door, I even agreed to cleaning the windows, but insisted it was to be only on the inside. The aircraft is currently fitted out with Royalty in mind, so the bedroom, dining room and en-suite, complete with shower and gold taps are all very different to the interior that you may remember. There are only 36 seats in total. Being the safety conscious group that we are, we ran two taxi tests, then two test flights, before she was given the ok to fly home. It's now December and it was time to say goodbye to our home away from home, the Erlesmere Hotel. This place made Fawlty Towers look luxurious and we sure could have used John Cleese for a bit of a laugh at times. So the wet and miserable morning of Friday 8th December was not going to deter us from leaving, in fact it was an incentive. We had many plans and options for the route home, but the longer the delay progressed, the worse the weather in our original planned transit stops of Montreal and Seattle became, snow and ice was coming in thick and fast, and so with some hasty re-arranging it was decided the "beach route" through the southern US, would be the way home for us. First stop Dublin, Ireland, still cool, no beach but at least not wet. This was not just an hour's stop for a Guinness but a tech stop to fill up with fuel as we had not been able to do this before because the short runway in Southend posed a weight penalty. Filled her we did, so much so she was overflowing, with a leak appearing in the left wing tank. Here we go we thought, just one stop from where we were, an hour away from all those marvellous facilities at Southend and we were running into problems. Some quick thinking and an even quicker take-off soon sorted that out, as the leak was only in the top of the tank….so as it burned off, the levels dropped almost immediately, hence the problem was solved. We packed overalls, spare parts, ladders, torches, lights and everything you could think of as we thought the engineers would be working each and every night repairing the problems that occurred during flight and then they would catch up on their sleep during the day while we were flying. The Pilots and Flight Engineers had their work cut out for them as the Auto Pilot was not working and sloppy in response, so when we were moving about the cabin and going from back to front, it got quite physical for them to keep us at the right altitude. The CASA representative we had brought along was there to keep us on our toes and sign off on any problems that we came across but alas that was our only hiccup. So an easy trip home for him. It was like she finally said, oh all right then off we go, lets get home, and that's exactly what happened. Our next stop Tenerife in the Canary Islands, Paella for 12 thanks! A nights rest after a big day being most welcome. Bermuda was next (and my favourite by far), and just when you think things couldn't get any better we flew to Orlando, Florida where we hooked up with John Travolta or JT, this was just magic, he had flown down to meet us! Here we parked the aeroplanes nose to nose for a publicity shoot. What an interesting man, he knew so much about our aircraft, where the routes were, the uniforms, everything. I am not sure if you watched the documentary that was recently on TV, but he is absolutely passionate about Qantas and flying in general. He graciously let us go over his aircraft and we had a great time swapping tales with his crew, who by the way all wear the full Qantas uniform. I remember his Flight Attendant asking to see what my china and glassware was like, and I said; "Darling, I don't even have running water let alone a china cup." The potable water system was one thing we didn't have time to fix, so we carried a large bottle of water and hand wipes for the toilets with a hot cup always on the go in the galley. From Orlando across the US to Los Angeles with a quick nights rest and a water cannon arch as a send off by the L A Airport Fire Dept. Down to Honolulu where by now it must be beginning to all sound a bit familiar to you, thankfully this was for two nights, the only city in which this was to occur. The others all said it was for me to go shopping but personally I think it was so all the lads could go to the hardware section in Sears. Early start and down to Nadi, and a very quiet night here not only because we had a 0430 start the next morning but for the political coup as well. The next day, the 16th of December was of course very exciting. Homeward bound. Finally, into Sydney. After we landed, we were towed into Hangar 216East to the strains of I Still Call Australia Home. I mean, you can just see it now can't you? When Qantas put on a show they can really put on a show. What felt really weird was that normally for me I am on the outside looking in. That Saturday I was on the inside looking out. Never before had I seen so many people waiting to welcome me home! I mean there were literally hundreds. We were greeted by Margaret Jackson, and Senator Ian Campbell who was at the time the Minister for Environment and Heritage and who had funded us to the tune of 1 million dollars. The future plans for this aircraft are to take her to the Qantas Founders Outback Museum in Longreach next month where she will be de-commissioned and put on static display for future generations to enjoy and understand the significance of this aircraft to Australia's and Qantas' history. It has been an absolute honour to be involved in this project, in fact I can almost go so far as to say that it was a life changing experience. The people I met along the way, the Flight Crew of course the Engineers and watching their dedication and work ethics was inspirational. Every day I learnt something new. So now, with there not being the restrictions of having to leave when married, the cost of a flight to London now being 3 weeks pay rather than 110, duty free shopping readily available and the glamour of being an international flight hostess still there, I hope to be able to continue along this path for some time yet.